Obviously, space it limited in the sprinter and I'm sure that is why I don't see many toilet/bath installations in the sprinters. 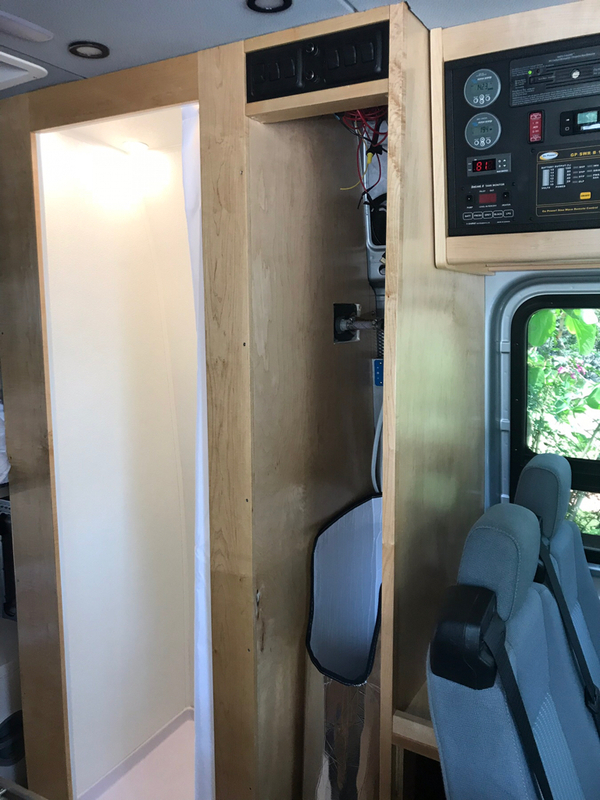 Who here has a sprinter with bath installation I can see for inspiration? The trick is to use the shower enclosure for multiple purposes to avoid wasting the space. Stuff is removed from the shower enclosure to use it as a shower. At the bottom on the left is a shower pan. At bottom on the right is the portapotti mounted on the 6 gallon shower water tank. There is a waste basket that sits on the shower pan and behind that is the parts in an ammo box to convert the waste basket to the shower water heater. Directly above the portapotti is a lower shelf that is hinged and removable. There are two containers for food and pans that sit on the lower shelf. Above the containers is a upper hinged and removable shelf. Upper shelf is at sink counter height to add counter space. At the top there are 3 removable towel rods. To use the portapotti the upper shelf is lifted and rotated so it is against the back wall of the shower. The two storage bins are removed. The lower shelf is lifted and rotated so it is against the back wall of the shower to expose the portapotti. To use the space as a shower continue removing stuff. Remove the two shelves, remove the 3 towel rods and remove the waste basket and ammo box. the trick is to know whats available along the route and at your destination. which i was told (by staff) was ok for overnighting and has heated+running water 24hour restrooms. I helped our sons friend do a conversion on his 144 high top. 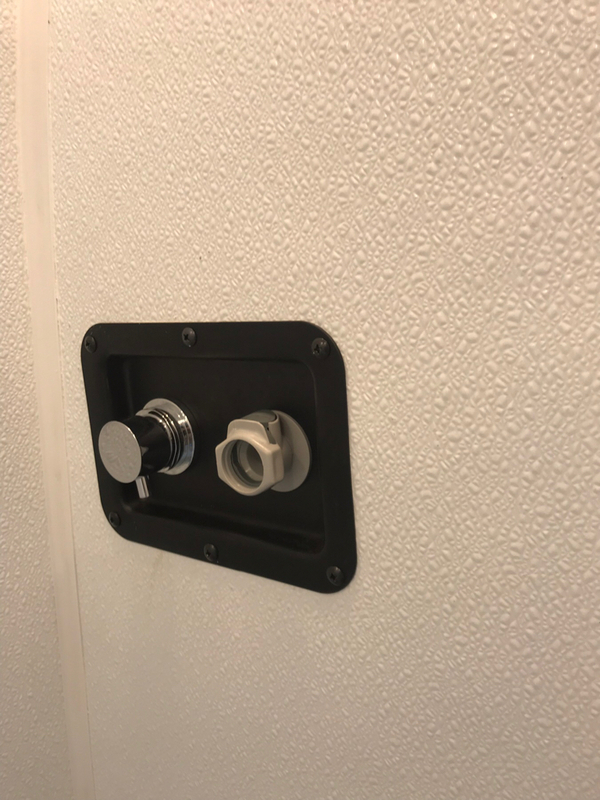 We installed a Natures Head composting toilet right inside the right cargo door with the vent in the floor right in front of the fender well. No plumbing required. He absolutely loves it. Sorry I have no pictures. Lots of video's on YouTube about them. Ok, so a shower started to seem like a good idea. What about an outdoor shower? 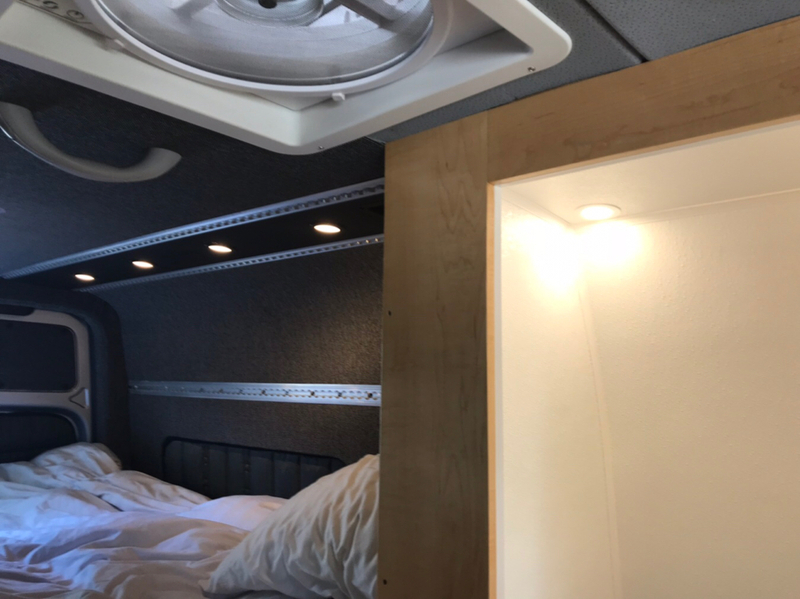 An outdoor shower would have been a great option, but I wanted to be in my van year-round, and an outdoor shower would only work in the summer. A good shower/toilet space was priority in our build. Shower drains straight out the floor, use a collapsible bucket below to catch the gray water, toilet has a quick release, and is super easy to remove to empty either at a RV dump or in a toilet facility. I installed both an indoor and outdoor shower. Have to say the indoor shower is one of the van’s best features. 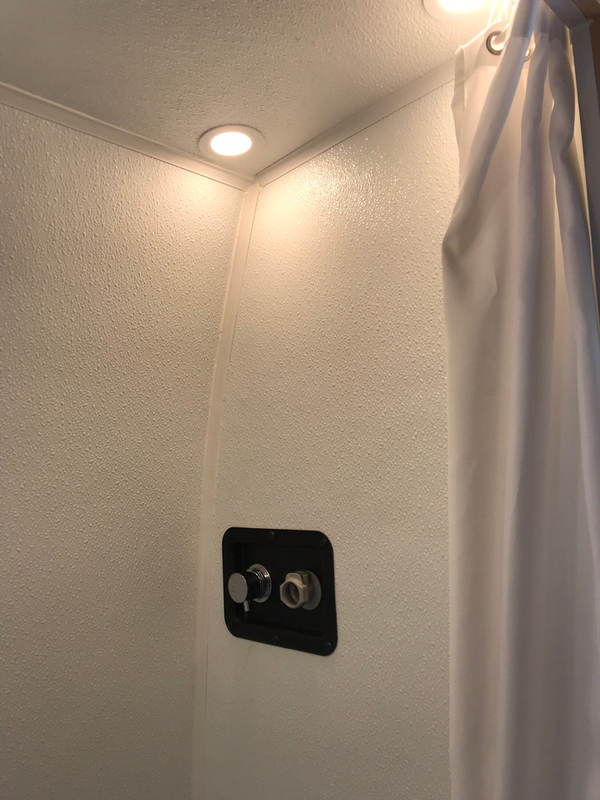 Both showers use the same small Admiral Marine flow/temp control and a 3/4” quick disconnect for the Camco shower hand wand with on/off control. The indoor shower pan from Amazon measures 24x27”, perfect size in my opinion. Water is supplied by a 46 gallon freshwater tank via a 4 gallon Isotemp water heater. The corner drain is routed to a 16 gallon gray water tank mounted behind the differential. The shower interior is FRP, fiberglass reinforced plastic, from Home Depot. A MaxxAir exhaust fan is located adjacent to the shower if needed. 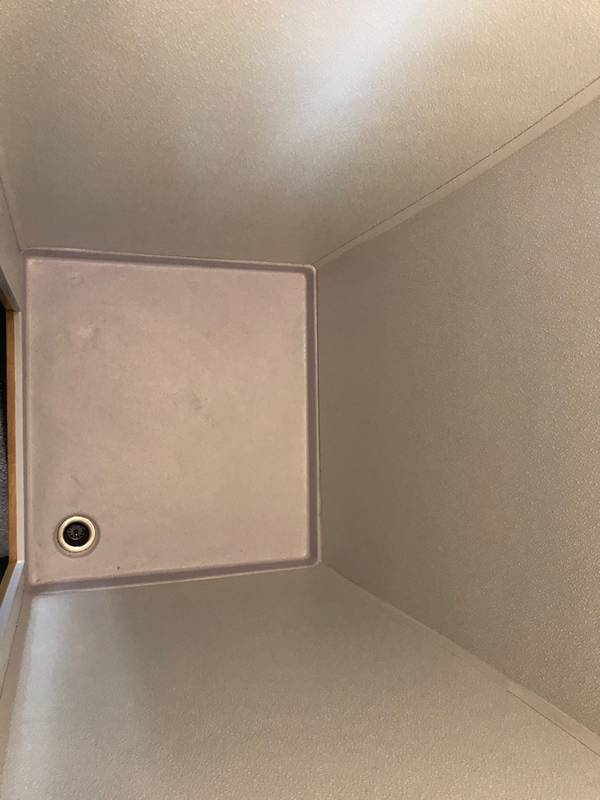 We typically place a Thetford Curve toilet in the shower for overnight use, otherwise the toilet is locked to the floor in the cargo area just behind the shower. We find we use the shower 10 times as often as we use the toilet. Last edited by gltrimble; 02-06-2019 at 04:55 PM.